The Linda Brodsky MD Essay Award, honors the women who have mentored, inspired, and encouraged young students to become physicians. Dr. Linda Brodsky was a pediatric otolaryngologist in Buffalo, NY and a lifetime member of AMWA. She had been a role model and mentor to many physicians throughout her career. In 2000, she became an activist for fair treatment of women physicians, after winning a lawsuit against her university and local hospital for Pay Discrimination. Through her business, WomenMDResources, she helped women physicians “get the jobs they want, the pay they deserve, and not become prisoners of their careers.” She was co-chair of the AMWA Gender Equity Task Force with Dr. Gebhard in 2013, but passed away in February of 2014 after sustained a subdural hematoma from a fall. The winner of the contest is presented with a $500 scholarship provided by Dr. Roberta Gebhard, DO, at the Annual Meeting and will have their essay published as the featured essay in the next edition of AMWA’s Linda Brodsky Memorial Journal. It is not necessary to attend the annual meeting to receive the award, but it is certainly encouraged! The next application period will be open from December, 15, 2018 to January 31, 2019. Email completed essays as an attached document to awards@amwa-student.org. Please keep essays under 1000 words. Congratulations to the 2018 winner of the Linda Brodsky MD Essay Award, Alyssa Frame! 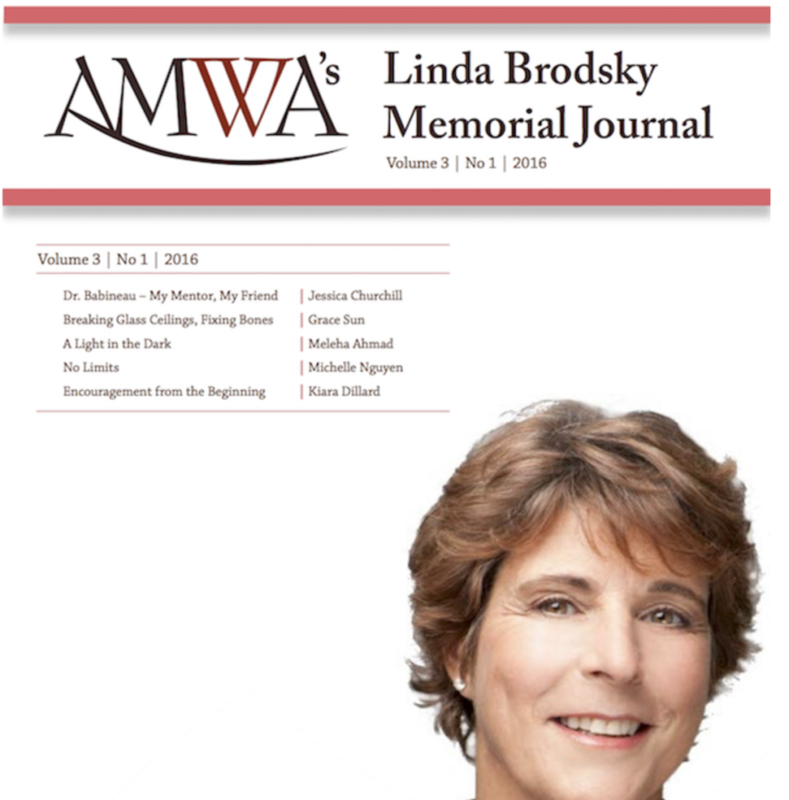 All winning essays are featured in AMWA’s Linda Brodsky Memorial Journal.